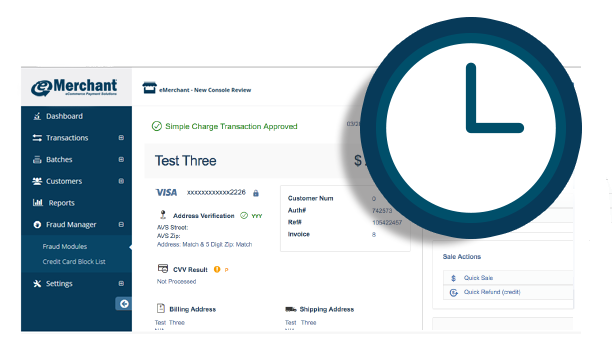 When a customer uses a credit card to pay for their purchase online, you have the choice to process their payment using either real-time or batch processing. Real-time processing allows you to get authorization for a transaction as soon as the transaction is submitted for processing. With batch processing, credit card transactions are stored and processed later as a group, usually at the end of the day. Real-time processing has several advantages in the online shopping world, especially if you primarily sell in-stock and virtual products. Each transaction is securely verified and either approved or rejected almost instantly. This means customers know within seconds about the status of their purchase, and you can rest assured that any goods are paid for before they are shipped or downloaded. It also increases your transaction security, as you aren’t at risk of shipping a product only for the payment to bounce. The biggest advantage to batch processing is that it reduces the chances of a stolen credit card being used, as this method allows more time for a consumer to report the card lost or stolen. But as long as proper anti-fraud measures are in place, real-time processing is the preferred method for any online-only merchant. Its speed, convenience and reliability will leave both you and your customers happy with the experience.